NEW BRITAIN - The New Britain boys volleyball program is now just over a fortnight old after its loss to Bloomfield on Wednesday, and head coach Michelle Abraham knows that while frustration might be mounting for the new team struggling to learn an unfamiliar sport on the fly, expectations need to be restrained. If anybody knows this, it’s Abraham. As New Britain’s girls volleyball coach for over three decades, Abraham watched 15-loss teams become state champions in just a few years’ time, and has won over 300 matches in her illustrious career. The Hurricanes have the right coach for the job to build a new program from the ground up, because Abraham knows the process it takes to construct a proper foundation, including the value of realism. 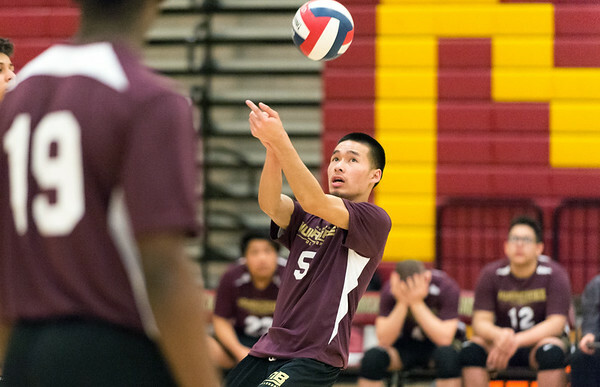 Some bonds have already begun to be formed, as members of New Britain have united over a common sense of pride: representing the first-ever boys volleyball team that will always be remembered as the group that started it all. Pacheo and the rest of the Hurricanes understand that wins are likely an added bonus this year, taking a back seat to the ultimate goal of becoming a functional team that paves the path for future teams to succeed. Abraham already sees signs of improvement, as the group of mainly strangers with no volleyball experience have begun to find a sense of comfort in their new surroundings. Wednesday was the team’s second 3-0 loss of the season, but again, the outcome was placed on the back burner, with the more important takeaway being the team’s progress, as well as the crowd on hand to support the pioneers of New Britain volleyball. The gym wasn’t filled to capacity, but there was a noticeable buzz, one that the players embraced and took as a reminder of why they are a part of Ground Zero for the Hurricanes. While most of the roster is completely new to volleyball, not all are new to New Britain athletics, which Abraham believes will give her new team a head start to building an eventual champion, one that will look back on its inaugural group with a sense of pride, knowing the program’s success began with their hard work. Posted in New Britain Herald, New Britain on Thursday, 4 April 2019 21:29. Updated: Thursday, 4 April 2019 21:31.